According to cinematographer Natty, the Vijay starrer Puli is full of twists that the audiences will remain glued to their seats till the last. The cinematographer-turned-actor is confident that the film will turn out to be a super duper hit as it has not only Vijay playing dual roles but also a very interesting story-line replete with a lot of twists. As already reported, the star will be seen in dual role and the latest news suggests that the actor will play father and son in the movie. 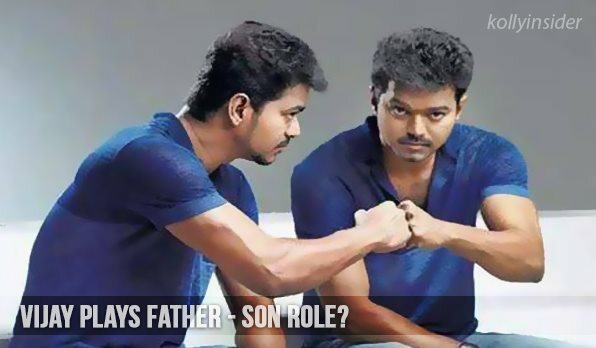 Apparently, Vijay is making sure that everything is going right for the look and attitude for the role. Some say that he will put on weight for the look of the father and will have variations in voice. Directed by Chimbu Devan, Puli’s shooting is currently in progress at the Mahogany Forest Thottam in Kerala. With a huge fan following in Kerala, Vijay took some time off to meet his fans at the shooting spot, revealed sources close to the team. Vijay will play the role of a warrior in the movie and the other role played by him is claimed to be that of an artist. Meanwhile, the makers of the movie are tight-lipped about the characters and the story of the movie. "Puli" is a fantasy adventure movie directed by Chimbu Devan. The Tamil movie features Kannada superstar Sudeep as an antagonist. Shruti Haasan and Hansika Motwani will appear as female leads in the movie. Legendary actress Sridevi will be seen in a pivotal role and will play role of a queen and as Hansika's mother. Sridevi's last Tamil movie was "Naan Adimai Illai" (1986) and her Tamil fans are expecting her to make a marvellous comeback with the Vijay starrer. The film also has Prabhu, Nandita, Vijayakumar, Thambi Ramaiah, Naren, Soori, Joe Malloori, Ajay Rathnam, Ali, Srinivasan, Vidyullekha Raman and others are in the cast. The film is produced by S Thameens and PT Selvakumar under the banner of SKT Movies.